Fatimata S has never recovered from being sexually abused by rebels in the northern town of Kidal in 2012. Years later, she still has nightmares when left on her own. But Fatimata has also regained her confidence and become a leader among other women – thanks to soap. This page describes how it happens. 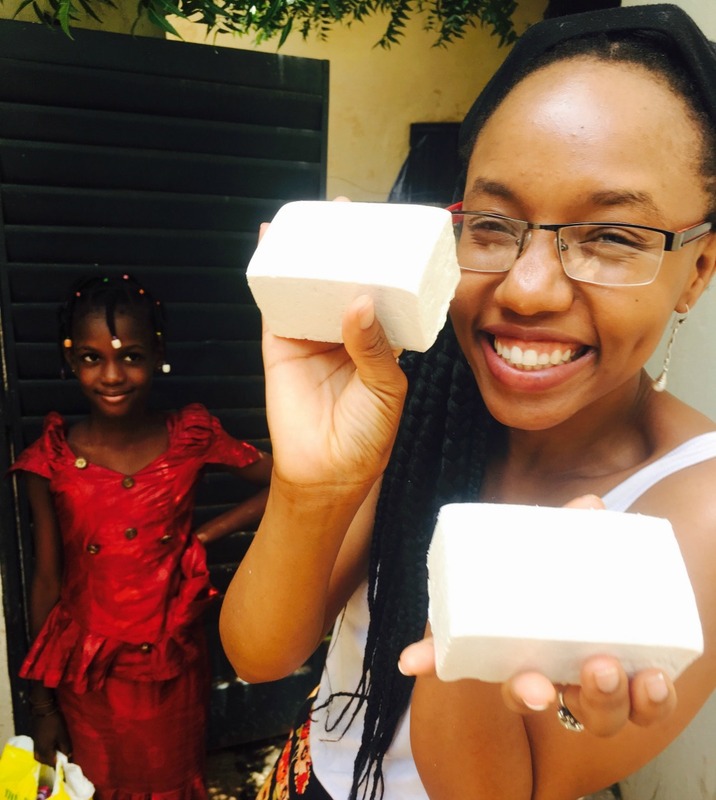 Soap is easy to make and much in demand in Mali, which makes it perfect for training. All women who pass through the campaign centers are trained to make two types – general purpose soap from palm oil, and body soap from the shea nut (also known as beurre de kerite). The shea oil is produced by hand by a cooperative of village women, the Ane Association, as described in this video. Back at the centers, trainees prepare the soap mixture under the watchful eye of their trainers, and pour mixture into molds, as shown in this video. Once hardened, the bars are separated, smoothed by hand, and packed in cartons or bags for sale at local markets. The effort to improve quality is never-ending. In June 2016 Peace Fellow Rose Twagirumukiza commissioned new soap molds from a local blacksmith and hired a carpenter to build a shed at the Bamako center where soap could be stored and kept clean. Rose also encouraged the soap team to keep an account of their sales. These improvements have boosted production. The two centers produced 780 bars in 2014, 4,253 bars in 2015, and almost 26,000 bars in 2016 – far exceeding the campaign target. As production has increased so have sales. This gives everyone an added incentive. In Bamako, three team leaders like Fatimata organize trainees into three groups. They pack the soap into cartons of 16 bars, which are offered at 2,250 CFA ($3.5) a carton with 60% of the profit going to the team. Experts at the haggle: Aminata S and Mama Konte at the Djelibougou market. The psychological benefit is almost as important as the money, as Iain Guest from AP observed when he accompanied Fatimata and her team to the Djelibougou market in Bamako in October 2016. Without hesitation they approached Mama Konte, who runs a stall and knows her soap (photo). Mama Konte liked what she smelled. “If I can sell the soap and it’s creamy I may buy some more” she announced. This impressed Aissata Coulibaly, another trader who was passing and bought two more cartons on the spot. Two men, who had been watching, also asked for soap but by now there were none left to sell. The excited trainees had sold five cartons of soap in less than 30 minutes. They celebrated by buying ice-cold water and headed back to the center to hand in the 6,750 CFA ($13) that they had earned. Each received over 1,200 CFA from their morning’s work, and they had enjoyed every minute. While beneficiaries like Aminata S gain confidence and an income from selling soap during training, the campaign does not yet help them to use their soap skills after they leave the centers. The reason is simple – money. Most trainees lack the money to buy a soap table, a cutting machine, molds or ingredients. These can only be purchased and used by a group. Soap-making is a collective enterprise. As a result, the campaign has developed a partnership with Moussou Kalanso, an association of 32 women in Bamako which meets every week to produce soap and host a Sini Sanuman animation. Twenty group members have fled from northern Mali since 2012. Five received training at the Sini Sanuman center and are very familiar with the campaign. To their credit the Moussou Kalansou group manages its money well. Awa Taboure, the treasurer, collects 100 CFA from every member and gives some of the proceeds to a poor family. Even so, Moussou Kalanso manages to maintain a healthy balance of around 600,000 CFA in its bank account. Peace Fellow Rose Twagirumukiza helped to strengthen the soap business. Moussou Kalanso produces 83 cartons of soap every month, which generates 182,000 CFA in sales. The biggest problem is space. Lacking a workshop, the are forced to set up their table in a crowded courtyard and suspend their soap-making when it rains. Even so, demand for their soap is brisk. As if on cue, a local customer Mariam Traore came by to purchase a carton and left contented. Impressed by Moussou Kalanso’s capacity, the campaign has decided to invest $1,000 in a new work shop where the soap-makers can make soap around the clock and also employ the five former trainees from the campaign. 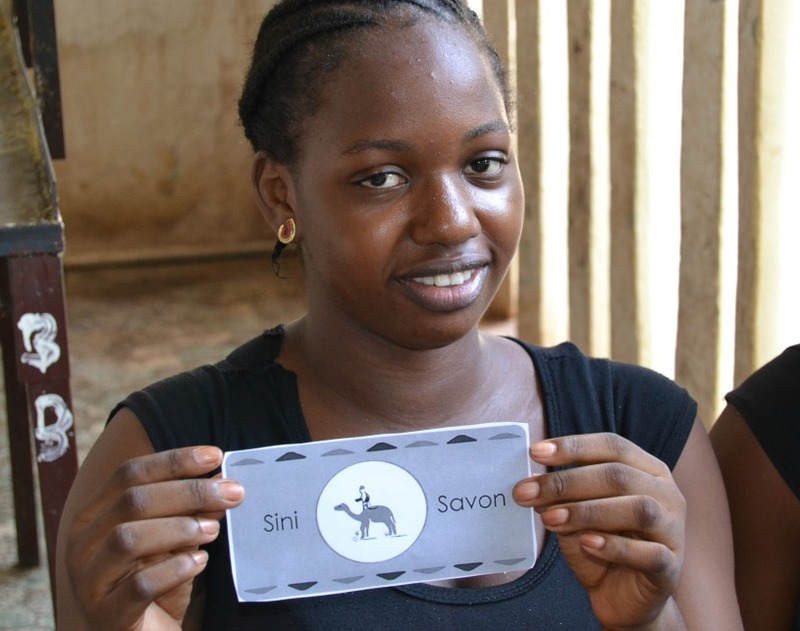 Sini Sanuman’s skilled soap trainer Aissata Toure will monitor sales and provide advice. 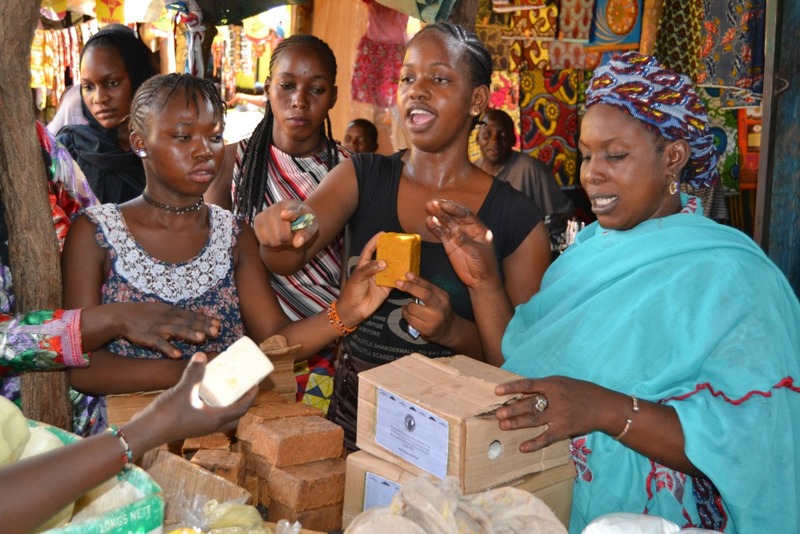 This growing soap enterprise in Mali has been helped by many friends in the US. Three Peace Fellows – Giorgia, Refilwe and Rose – helped to put the system in place and raised over $1,500 through personal appeals. Rose brought back 75 bars of Sini Savon to Washington, where it was packaged and labelled by AP’s talented interns. Intern Rachael Hughen persuaded her team-mates from the George Washington University running team to take samples to a local Farmers Market. They sold enough to suggest that there might be a serious market for Sini Savon. Finally, another AP friend, Luigi Laraia, from the World Bank, raised over $6,000 for the Mali soap makers by climbing Mount Denali in Alaska. In short, the campaign entered 2017 on a wave of good will, with some money to spend and a clear plan for sustainability – on a high note!